Some 4500 years ago, the ancient Egyptians built the Great Pyramid of Giza as a tomb for the pharaoh Khufu, also known as Cheops, one that would ferry him to the afterlife. Now, using subatomic particles raining down from the heavens, a team of physicists has found a previously unknown cavity within Khufu’s great monument. “Such a big void can’t be an accident,” says Mehdi Tayoubi, president of the non-profit Heritage Innovation Preservation Institute in Paris, who led the research. The discovery has already stirred the interest of archaeologists and particle physicists alike. Made of an estimated 2.3 million stone blocks and standing 140 meters tall and 230 meters wide, the Great Pyramid is an engineering mystery, much like its two smaller sister pyramids, Khafre’s and Menkaure’s. Archaeologists know that it was built for Khufu, who died in 2566 B.C.E. But they have long wondered exactly how the pyramid was constructed and structured. Now, archaeologists are getting help from an unlikely source: cosmic rays, subatomic particles that rain down from space. 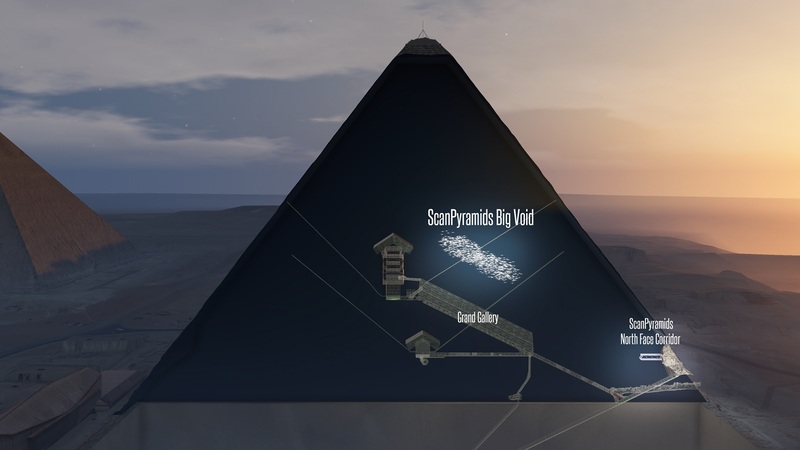 In fact, a team of physicists has found a previously unknown void within the pyramid by imaging it with muons, high-energy byproducts of cosmic rays that are created when protons and other atomic nuclei strike the atmosphere. Every minute, tens of thousands of muons pass through each square meter of Earth. The particles are much like electrons but 207 times as massive. Because they’re so heavy, the negatively charged particles can travel through hundreds of meters of stone before being absorbed—whereas electrons make it only a few centimeters. So just as doctors use x-rays to look into our bodies, physicists can use muons to peek into thick structures—from volcanoes to disabled nuclear power plants. To do that, all researchers need to do is to place a muon detector, such as tile-sized special photographic films, underneath, within, or near an object and count the number of muons coming through the thing in different directions. One of the first times scientists used muon imaging was to search for hidden chambers in Khafre’s pyramid at Giza in the late 1960s. None was discovered. This time around, after a 2016 experiment revealed anomalies that could indicate something behind its walls, scientists set out to image Khufu’s pyramid. To do that they placed various direction-sensitive muon detectors in the queen’s chamber and in an adjacent corridor within the pyramid and at its base on the north side, and analyzed the collected data every 2 to 5 months. As proof of principle, they confirmed the presence of three known large cavities: the queen’s and king’s chambers, and a long corridor that connects them, known as the grand gallery. But, just above the grand gallery the researchers also spotted a new void area, they report today in Nature . The new cavity is nearly 8 meters high, 2 meters wide, and at least 30 meters long—like a cathedral, but much narrower—and it rises 20 meters above the ground in the pyramid’s core. The scientists have “seen” the void using three different muon detectors in three independent experiments, which makes their finding very robust, says Lee Thompson, an expert in particle physics at the University of Sheffield in the United Kingdom who was not involved in the work. But the cavity’s detailed structure remains unclear: It might be one or many adjacent compartments, and could be horizontal or slanted. At this stage, the cavity’s function can only be guessed. Because it is inaccessible, it probably isn’t a burial chamber, says archaeologist Mark Lehner, director of Ancient Egypt Research Associates in Boston, who was not involved in the research. “It’s not the ideal place to contain a body,” he says. It could have purely symbolic meaning, as a passage for the pharaoh’s soul, Tayoubi says. Zahi Hawass, an Egyptologist based in Cairo who chairs the committee that reviewed the research project, cautions against calling the cavity a “secret room,” as pyramid builders often left large gaps between stone blocks, a construction strategy that makes the pyramid’s core look like Swiss cheese. The void might simply have served to relieve the weight of the stone blocks above the grand gallery to preserve it from collapse, like the five compartments, stacked on top of each other, that protect the king’s chamber in the same pyramid, Lehner says. To answer questions about the cavity’s structure and function, the researchers hope to do more muon imaging experiments with finer resolution. This means placing more detectors inside and near the pyramid that collect data for longer—up to several years, Tayoubi says. Understanding the detailed structure of the cavity could also help determine how the Great Pyramid was built in the first place, whether using external ramps or internal passages through which stone blocks were carried to the higher levels of the structure. Until then, the new finding, although “impressive,” doesn’t dramatically change the way we think about pyramids, Lehner says. But other scientists, such as particle physicist Guido Saracino of the University of Naples Federico II in Italy, are thrilled. According to Saracino, this work confirms that particle physics can have important practical applications, including archaeological surveys. And one day it may help scientists figure out how the ancient pyramids were built. ANUNNAKI: THE ‘FORBIDDEN’ MOVIE THAT NEVER CAME TO THE CINEMAS, WHY? Navy Engineer: I Saw Ancient Ruins, Aliens, And Top-Secret Bases In Antarctica!